Thank you, Brandon for your honest take! The only thing I might add is my agenda. What I want to accomplish is very simple; I want to make more room for such discussions to occur. But it’s not about talk…that’s only the first step. I’m encouraged by such discussions going on in on-line forums like EMTlife.com (Full disclosure, I’m a Community Leader there but I– usually!– only add to discussions already going on. ), AND my prayer is that this kind of support will be able to happen more and more in-person, peer to peer. The reason EMS is not a true profession after some 40+ years is that too many good people fade away before they have a chance to truly commit to MAKING it a profession. To those of us remaining in the field, they fade away, but in reality it’s all about very personal burnouts. Since they don’t talk about it neither do we. But what if we ALL started talking about this stuff as if it mattered? I think if EMS is to become a profession, first we have to save ourselves. That’s why I spent 15 years working on the book. That’s why I’ve been active in on-line EMS Forums since 2005. 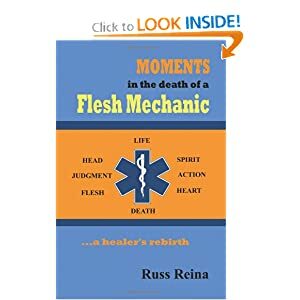 The book can be bought through my publisher, at http://www.russreina.com and is available from Amazon and the other on-line Biggies. No Stethoscopes, stupid T-shirts, or EMS mugs for Christmas. A better idea from an old hand and old friend of EMS. This book gives a very realistic and insightful account on the topics not spoken about in the classroom or when trying to impress by regaling an audience with life and death exploits, but are very real. At one point in an EMS career whether just passing through EMS or as a life-long pursuit, EMS persons will have to come to terms with the mental and emotional impact of regularly being around human suffering that those not involved can hardly imagine. Additionally, the book gives a realistic first hand retelling of the birth and early progress of US EMS. If you know where you have been, it is easier to plot where you are going. Some things also have never changed. If you are planning to get into EMS, having the knowledge Russ shares before you start is undoubtedly going to give you a realistic perspective of what to expect, both good and bad, as well as opening thoughts and encouraging communication about the elephant in the room most pretend does not exist. I do not receive any benefit for my opinions on this book, monetary or otherwise, other than the perspective it brings. Were it up to me, I would make it mandatory reading for all providers. Absent that ability, all I can do is bring it to your attention. The benefit of the knowledge it brings will last longer and be more valuable (What is the price you would put on your sanity or preserving your passion for your chosen career?) than any trinket you can purchase this or any other season. It will also probably cost a lot less too.